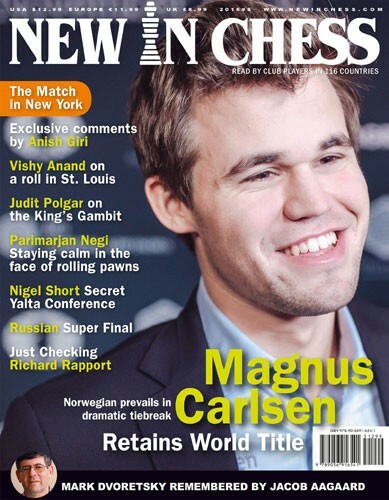 New In Chess magazine is a premier international chess publication with eight issues a year, offering on-site tournament reports, game annotations by top grandmasters, interviews, in-depth reportage, exclusive columns by Anish Giri, Jan Timman and Nigel Short, historical features, iconic photography, book reviews and puzzles. Regular contributers are: Magnus Carlsen, Vladimir Kramnik, Levon Aronian, Vishy Anand, Sergey Karjakin, Hikaru Nakamura, Garry Kasparov, Veselin Topalov, Peter Leko, Alexei Shirov and Judith Polgar. How Willie Nelson played Ray Charles in the dark. Rameshbaba Praggnanandhaa, remember that name! The move of the year. How 3-year old Mikhail Osipov refused Karpov a draw. There are 180,000 rated players in the world. Where do they live? 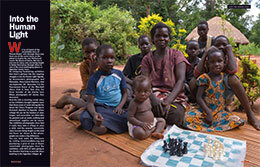 What Nana Moukouri, Albert Einstein, George Steiner, Stephen Fry and others said about chess. 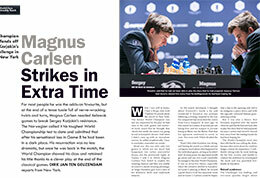 Magnus Carlsen strikes in extra time with a brilliant finish. 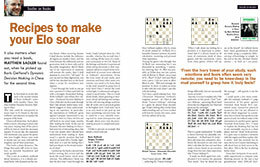 A 30-page on-the-spot report from Dirk Jan ten Geuzendam with brilliant and entertaining annotations by Anish Giri. Our columnist reveals how, in 2003, in a hunting lodge in Yalta he played a secret training match against Ruslan Ponomariov. Vishy Anand was on a roll at the Champions Showdown. Alejandor Ramirez reports and Vishy himself annotates his win over Nakamura in the blitz. 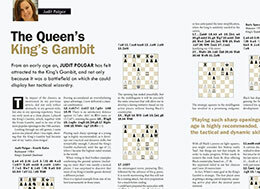 The Queen of Chess has always felt attracted to the King’s Gambit. Jacob Aagaard remembers Mark Dvoretsky, a great trainer, a brilliant author and a dear friend. A highly personal tribute. Parimarjan Negi shows that you don’t need to be afraid of playing against connected passed pawns, as long as you keep a clear head. In Novosibirsk, Alexander Riazantsev and Alexandra Kosteniuk became the new Russian champions. 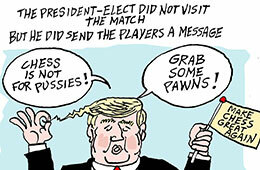 They both annotate a key game of the Championship. A risky early deviation from theory against the Queen’s Gambit. If you play like Carlsen and Grischuk you may win. As he was reading Timman’s Titans, Hans Ree took a walk down memory lane. Arthur van de Oudeweetering shows that giving up the bishop pair makes perfectly good sense, sometimes. Matthew Sadler reviews four books: 'Dynamic Decision Making' by Boris Gelfand, 'Timman's Titans', 'Fundamental Checkmates' by Antonio Gude and 'The Exchange Sacrifice' by Sergey Kasparov. Jan Timman explains why Nigel Short and Ivan Sokolov defeated Hou Yifan and Jorden van Foreest in Hoogeveen. What is Richard Rapport's favourite square? I was fortunate enough to be one of the yearly subscription winners from 2012, which introduced me to this excellently crafted, wonderful chess magazine. I could not believe the fantastic reporting and lovely photography that is utilized by the publisher. 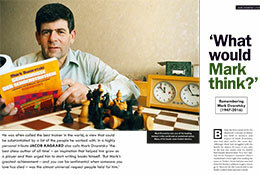 All top events are covered in the best chess magazine in the world. Secrets of Opening Surprises is a nice touch in this publication, which will give you a new trick up your sleeve for your next chess club meeting. Overall, like I said, this magazine is simply the best.